Let me tell you about a movie that completely blindsided me recently (in a good way). It's my pick for "Movie of the Week" and its name is "The Bear". It's not a film you hear discussed much these days, but it was significant enough in 1988 that it managed to get an Oscar nomination for Best Editing. "The Bear" opens with the images of a pair of bears, rummaging for food in an undisclosed mountain woodland. They are a mother bear and her cub and they are blissfully unaware that their lives about to change. While digging through the mountainside, a rock slide occurs, knocking the mother dead. Now an orphan, the bear cub must now fend for himself in this dangerous world. It's quite a dark opening for a supposed "family" movie and given this classification, I expected to hear a subsequent long "Noooo!" or something of the sort. I waited for it...but nothing. It soon dawned on me that this film would be almost completely dialogue free (save for some token lines from villainous hunters). All my expectations were swiftly knocked aside. 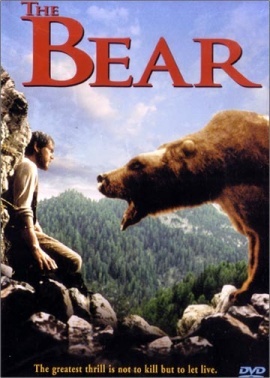 This was a film starring real bears (animatronic bears were used for the violent scenes), without any anthropomorphisms. In effect, I was watching a nature documentary, albeit formed into a fiction narrative. This tale of survival really picks up when we are introduced to the cub's future guardian (a large male grizzly bear) and the film's antagonists (a pair of hunters). As the bears try to evade these men, the plot unfolds with suspense, drama and even some comedy. It's amazing how much mileage director Jean-Jacques Annaud manages to get out of his use of sound, cinematography and weather elements. The score sells the danger/tension surrounding the approaching enemy and the sentimentality of the bears' burgeoning friendship. Likewise, the look of the film evokes the various feelings that our main character is going through. It all makes for an engaging viewing experience, often for the sheer originality of the concept. Granted, there are some dull stretches. These mainly come when the director relies on the bears to naturally do something interesting without stimuli. Though when you consider the difficulty involved, you can't help but be impressed. "The Bear" is not founded on any extraordinary screenwriting. Instead, it grabs the viewer with simple naturalism to foster appreciation for these animals. That it manages to do so without any Disneyfication (we even see the bears in kill mode for food) or explanatory narration is a tremendous accomplishment. It's truly a relic of the type of family film that we rarely see anymore. I'm certainly glad I didn't dismiss this film based on its poster and IMDb description. Go on and check it out for yourself.